Today, we were in Beverly Hills for our monthly meeting...it was an easy drive, as many people are including the rest of week as part of their New Year's holiday. Afterwards, we decided to go to the Grove, a new luxury commercial development near Farmers Market, because, it was one of the few place with a Barnes & Noble in the immediate vicinity of Beverly Hills. We are noticing that the newer architecture in shopping malls is trending to human scale. Each building is different like it would be in a small town. 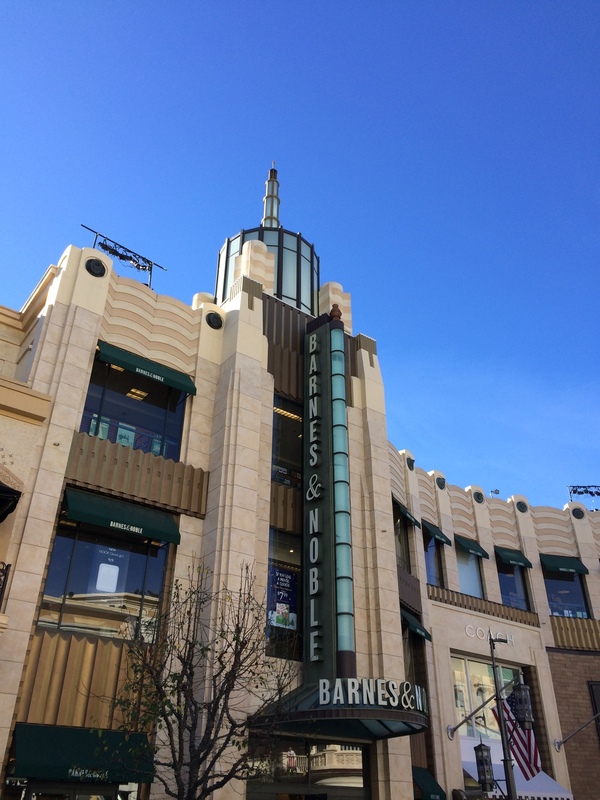 Notice the Barnes & Noble building (above) is a deco style, while the Barney's is more modernistic. This outdoor shopping mall has the feel of a small downtown, and is paved with cobblestone and interesting tile inset work. They also have a tram running through the center, a beautiful fountain, great places toe at and a multi-plex theater. It is within walking distance of the neighborhood of upscale homes, as well as the CBS studios and offices. We think that human scale commercial real estate is one of the trends for 2014, based on our observations of the newer development in California's, and in parts of the USA that we have visited over the past few years.